In 1828, Friedrich Wöhler synthesized urea - a substance hitherto thought to be produced only by living organisms - from simple inorganic substances. The discovery was a watershed in the history of science. In one fell swoop it shattered the widespread doctrine of vitalism which held that there is something fundamentally different between the animate and inanimate worlds. Wöhler was the triumphant messenger, heralding great expectations for the new adventurers while shattering the dreams of keepers of the faith. Only ten years before in 1818, a different kind of vitalism was being conceived. That was the year when Mary Shelley published "Frankenstein; or, The Modern Prometheus". 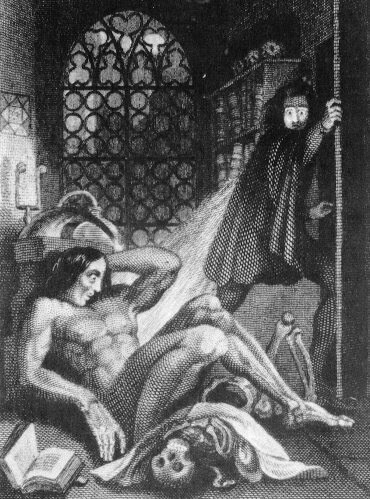 "Frankenstein" did for the science fiction genre what Wöhler did for chemistry. It infused the vivid imaginations of generations of writers, thinkers and movie-makers with notions of reanimating dead matter. Now fast-forward to 1960. Woodward synthesizes chlorophyll. Chlorophyll. The substance which more than any other fuels life on this planet. There are telling similarities between Wöhler's synthesis of urea, Shelley's creation of "Frankenstein" and Woodward's synthesis of chlorophyll. All three speak to man's mastery over Nature. All three embody a conscious or unconscious sense of hubris. And all of them tell us that the allure of vitalism is still alive, albeit in a very different sense. The chemists of Wöhler's generation strove to annihilate the distinction between living and non-living. But the synthetic chemists of Woodward's generation want to do one better and are closer to the brilliant, troubled protagonist of Shelley's novel; they want to not only starkly state the difference between life and death but they want to become the creators of both. Wöhler's urea and Woodward's chlorophyll demonstrate the second reason for the cultish status of organic synthesis. The first was the cult of personality, but the second is the all-powerful cult of elemental ambition. There is a truly seductive feeling of power in being able to synthesize a substance like chlorophyll whose constitution and very identity seemed for years to be among Nature's most closely guarded secrets. A creature who could unravel the workings of this most fundamental of nature's engines would announce himself to be a true master of creation. What better way to make this announcement than to not only tease apart the strands of this secret but to create it from scratch? In fact it's worth noting the other landmark Nobel Prize winning discovery related to photosynthesis: the unraveling of the structure of the photosynthetic reaction center protein by Harmut Michel, Johann Diesenhofer and Robert Huber. As important as it was, the psychological impact of even this discovery cannot compare to the creation of chlorophyll through human ingenuity. That is why, among all the chemical sciences, organic synthesis still enjoys a unique status. It harkens back to one of man's deepest and most primitive desires, to remake the world in his image; to first closely study, then mimic, and finally improve over nature. There can be no higher accolade for a species than to be congratulated for being able to trump it's very creator. This accolade is manifest in the Nobel committee's tribute to Woodward as well as to organic synthesis when it noted that "It is sometimes said that organic synthesis is at the same time an exact science and a fine art. Here Nature is the uncontested master, but I dare say that the prize-winner of this year, Professor Woodward, is a good second." In addition organic synthesis not only creates the molecules of life but it saves life, and the production of novel drugs further drives the image of synthesis as an instrument of human triumph. The new science of synthetic biology promises to satisfy the same craving. The deliberate synthesis and rearrangement of genes to create new organisms from scratch promises the same kind of psychological benefits that the total synthesis of complex substances afforded to both organic chemists and lay audiences. No wonder that discoveries by Craig Venter and others are heralded in the press as the dawn of a new age, and they undoubtedly are. But in terms of their goals, these spectacular advances simply constitute the extensions of an age that began in 1828. And the psychological need goes back even further, when man was living in caves and creating innovative tools, agricultural implements and clothing from animal hides. It's just vitalism and Frankenstein writ large all over again. I'm not sure that the gravity of Wöhler's achievement was understood for a long while afterwards. Your thesis is interesting. The ability to engineer the constitution of matter enabled our deep desire to extend our control over the world. Power is the ability to allocate resources. And the ability to allocate synthetic resources allowed for the conquest of entirely new frontiers and wealth which were quite apart from land or geography. Indeed. In fact I think Wohler's contemporaries did not discard vitalism until later and many also think that organic chemistry's true beginnings were kicked off by Kolbe's synthesis of acetic acid from carbon dioxide. Yet philosophically the axe seems to have fallen with Wohler's act, especially his letter to Berzelius which stated that he could make urea without a dog kidney. I like the way you described the utility of organic synthesis as our ability to extend our control over material objects. Manipulating the molecular composition of matter is the ultimate manifestation of the simple manipulation of fire, earth, air and water that primitive man achieved.